The Luberon wine appellation is in a sense the orphan of the Vaucluse. The private estates, which account for only twenty percent of the appellation’s production, do not attract the attention of wine raters that is accorded the other wine labels in the Southern Rhone, including the wines of the Ventoux. Created in 1988, the appellation is a swath of 36 communities bordered on its northern edge by D100 from L’Isle-sur-la-Sorgue to Apt, stretching down to the Durance River to the south. Luberon red wine, 70% of the appellation’s production, must have at least 60% of Syrah and Grenache. Profile: Three red vintages, one white and one rose. Run by the Monod family since 1999. Quality producer of 35 acres. Profile: A gorgeous site of rolling hills and verdant vistas maintained by Allen and Marie-Laure Chevalier with their three daughters. 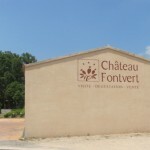 The Chateau produces three red vintages, two white and one rosé. Grape varieties are Grenache, Syrah, Carignan and Mourvèdre for the Reds; Ugni-Blanc, Roussanne, Clairette, Vermentino for the Whites. Taste: Cuvée des Fondateurs, aged in oak barrels for a year, is an exceptional red – rich texture and deep flavors. The ‘bleed’ Rosé, known as rosé d’une nuit, is an aromatic and perky drink, a must for lovers of this carefree vintage. Profile: Chateau Val-Joanis is one of the renowned properties in the Luberon. Located on the site of a Roman villa where wines were once delivered to Rome, the property and the vineyards underwent a major renovations and rehabilitation beginning in 1977. The vineyard of 145 acres extends up to an altitude of 1640 feet, the highest plots are called Les Griottes. Three reds, two whites and two rosés are produced. 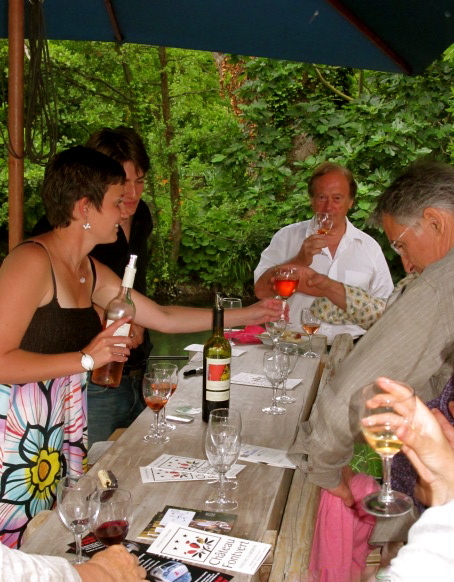 Last spring, Chateau Val-Joanis welcomed Anthony Bourdain and his “No Reservations” Travel Channel crew. 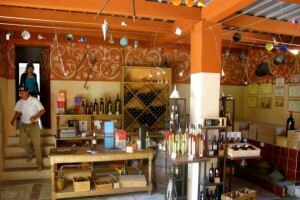 Lovely wine shop. Address: 84120 Pertuis, Directions: Located between Pertuis et Villelaure on D973, 2 Km after you leave Pertuis on your right. Look for sign. Profile: An astonishing site and vineyard of 45 acres renovated and reinvigorated by Jean-Louis Descours and his son Gérard. When the Descours assumed control in 1981, a wine cooperative accepted the property’s entire production. Four reds, two whites and a rosé. Taste: The Grand Deffand Red 2004, 95% Syrah and 5% Grenache, is a wine of great complexity with intense fruit and aromas of black currant, toasted coffee and leather. If you have one red to take away with you from the Luberon, this is the one. Address: 84360 Puget-sur-Durance, Directions: Enter Merindol take Direction Lauris-Pertuis. After 6,6 Km, turn left, direction Les Baumes (C12), and 0.8 Km, take a right, direction Lotissement Les Baumes (D 173). After 0.8 Km, enter the Bastide de la Verrerie by a small bridge on the left. Profile: A dynamic winery producing 12 vintages, ranging from an intense red of old vines (18 months in barrels) to a range of other red white and rose wines. Taste: the Veilles Vignes; a Vin de Pays Syrah; La Garance, a Ventoux red, and the L’Oppidum rosé.